What would a perfect protein bar look like to you? You know, a protein bar that’s an ideal on-the-go snack, midafternoon pick-me-up, or healthy and guilt-free treat? Well, all that is exactly what you get with our baked-to-perfection, naturally sweetened and flavored high-protein bar that’s gluten-free, low in calories and sugar, and downright delicious. Specifically, each bar contains 20 grams of high-quality protein from a blend of whey isolate, whey hydrolysate, whey concentrate, and pea protein isolate. There are no second-rate ingredients like milk protein, calcium caseinate, or soy protein. What’s more, each bar provides 10 grams of prebiotic fiber, which contains half the calories of “normal” carbs and supports gut health, improves bowel regularity, strengthens the bones and immune system, and more. 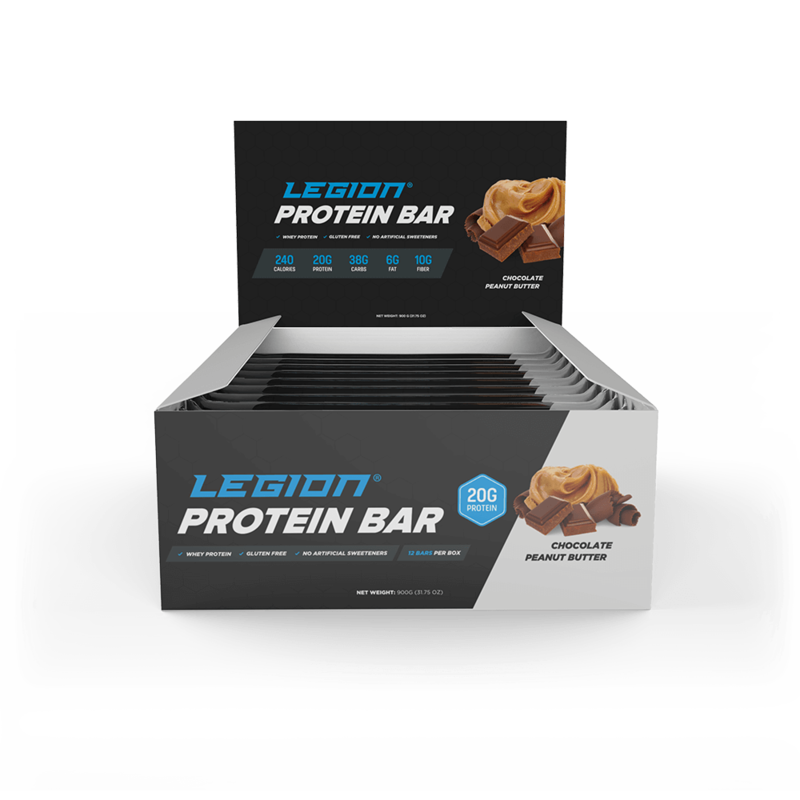 Oh, and let’s not forget that each Legion protein bar also contains just 6 grams of fat, 5 grams of sugar, and 240 calories, which means it can fit into even the strictest of meal plans. ... the Legion protein bar is for you! Unlike most protein bars, ours contains a blend of some of the highest-quality types of protein you can buy: whey isolate, whey hydrolysate, whey concentrate, and pea protein. What you won’t find are cheap, low-quality forms of protein, like milk protein and calcium caseinate, or soy protein, which many people find undesirable for a number of good reasons. What this means is every gram of protein in every Legion bar you eat can be efficiently and effectively used by your body to build muscle, recover from workouts, and support health and weight loss. Prebiotic fiber is a kind of indigestible fiber found in foods like onions, bananas, and beans that encourages the growth of beneficial bacteria in the gut. Moreover, studies also show that many people don’t get enough prebiotic fiber in their diets, which can raise the risk of various types of disease, including heart disease, cancer, type ll diabetes, and osteoporosis (weak bones). Every Legion protein bar contains 10 grams of prebiotic fiber in the form of chicory root fiber and soluble corn fiber. Chicory root fiber is a form of prebiotic fiber found in chicory, a plant related to dandelions. We included it in our protein bars because in addition to providing the benefits of prebiotic fiber, it’s also an excellent source of antioxidants and has a pleasant, nutty taste. Soluble corn fiber is a prebiotic fiber produced from corn starch. We included it because in addition to providing the benefits of prebiotic fiber, evidence also suggests it can improve bone density by increasing calcium absorption. It also improves the protein bar’s mouthfeel and tends to be easier on people’s stomachs than other forms of prebiotic fiber. So, every time you eat a Legion protein bar, you’ll provide your body with a full serving of vital prebiotic fiber that supports your overall health and well-being. Our protein bars don’t sit on shelves for months on end and so are never stale. That means you never get dry, sandy, crumbly mouthfuls of blandly distasteful crap you can barely swallow. Instead, every Legion protein bar is savory, moist, and pleasantly chewable. Our goal was to create an all-natural bar that tastes like high-protein candy, and many of our customers say we’ve done just that! Additionally, our protein bars are naturally sweetened and flavored with stevia and erythritol and contain absolutely no fillers or artificial sweeteners, flavors, dyes, or other chemical junk. While artificial sweeteners may not be as dangerous as some people claim, studies suggest that regular consumption of these chemicals may indeed be harmful to our health and that more research is needed. That’s why we’ve chosen to go with the natural sweeteners stevia and erythritol instead (and we’ve paid special attention to the amount of erythritol so our bars are easy on your stomach!). Research shows that not only are stevia and erythritol safe, but they can also confer several health benefits, including better insulin sensitivity, a lower cholesterol profile, improved blood glucose control, potential anticancer effects, lower blood pressure and inflammation levels, and more. Many supplements also contain artificial dyes, and while the regular consumption of these chemicals might not be as harmful as some would have you believe, there is evidence that they can cause negative effects in the body. As for artificial flavors, they appear to be benign but just aren’t necessary. Natural flavors can taste equally good. And last but most definitely not least, it’s absolutely delicious. You won’t believe it’s not candy! 06. Fiber and prebiotics: mechanisms and health benefits. 15. Anti-inflammatory activity of roots of Cichorium intybus due to its inhibitory effect on various cytokines and antioxidant activity. 19. What made Canada become a country with the highest incidence of inflammatory bowel disease: could sucralose be the culprit? and we're proud to share their photos with you! Protein Blend (Whey Protein Isolate, Whey Protein Concentrate, Pea Protein Isolate, Whey Protein Hydrolysate), Chicory Root Fiber, Vegetable Glycerin, Brown Rice Flour, Peanut Butter Confectionary Wafers (Sugar, Palm and Palm Kernel Oil, Partially Defatted Peanut Flour, Non-Fat Milk Solids, Peanut Oil, Salt, Soy Lecithin), Soluble Corn Fiber, Isomathulose, Palm Oil, Water, Peanuts, Peanut Butter (Peanuts, Palm Oil, Dextrose, Salt), Chocolate Confectionary Wafers (Sugar, Palm and Palm Kernel Oil, Cocoa [processed with alkali], Non-Fat Dry Milk, Soy Lecithin, Vanilla), Cocoa (processed with alkali), Sugar, Natural Flavors, Salt, Potassium Sorbate and Almond. Contains Milk, Soy, Almond and Peanut. Manufactured in a plant that processes Milk, Soy, Wheat, Treenut, Peanut and Egg. Protein Blend (Whey Protein Isolate, Whey Protein Concentrate, Pea Protein Isolate, Whey Protein Hydrolysate), Sugar Free Chocolate Chips (Erythritol, Palm Kernel Oil, Cocoa [processed with alkali], Sunflower Lecithin, Stevia Glycosides, Milk), Chicory Root Fiber, Vegetable Glycerin, Chocolate Confectionary Wafers (Sugar, Palm and Palm Kernel Oil, Cocoa [processed with alkali], Non-Fat Dry Milk, Soy Lecithin, Vanilla), Soluble Corn Fiber, Isomathulose, Brown Rice Flour, Palm Oil, Water, Sugar, Natural Flavors, Salt, Potassium Sorbate, Almond and Peanut. Contains Milk, Soy, Almond and Peanut. Manufactured in a plant that processes Milk, Soy, Wheat, Treenut, Peanut and Egg. How many bars come in each box? Can I buy bars individually? For now, we're only offering full boxes but may be able to offer individual bars in the future! 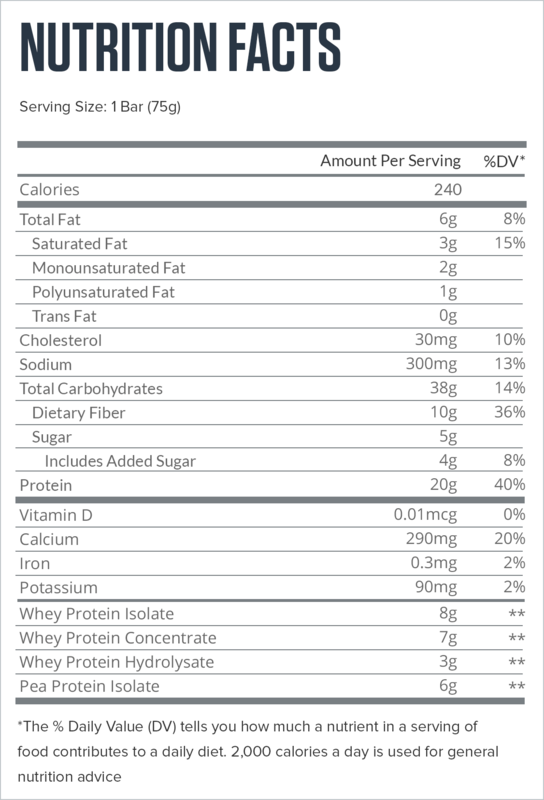 What are the calories and macros for your bars? Each bar contains 240 calories, 20 grams of protein, 38 grams of carbohydrate, 10 grams of fiber, and 6 grams of fat. Why do the macros add up to 286 calories and not 240? Because while most types of carbohydrate contains about 4 calories per gram, carbs from fiber and erythritol contain less. Specifically, insoluble fiber contains no calories, soluble fiber contains about 2 calories per gram, and erythritol contains about 0.2 calories per gram. Thus, to convert the bar’s macros to calories, you need to differentiate between the grams of carbohydrate that contain 4 calories and those that contain less. How do your bars compare to other popular protein bars? The first thing you’ll notice is how much better our protein bar tastes and feels in your mouth. It’s fresh, moist, and chewable, and many customers say it tastes more like a candy bar than a protein snack. We’ve also taken special care to ensure our bars are easy on your stomach, which is often a problem with other naturally sweetened, high-fiber protein bars. And while you may not realize it, your body and muscles will appreciate that we’ve used only high-quality sources of protein (whey and pea protein) instead of cheaper options like milk protein, calcium caseinate, and soy protein. I heard corn fiber is bad for you and can upset your stomach. Is that true? Corn fiber has gotten a bad rap among some because it’s inexpensive. Many supplement and food companies have used this to attack their competitors who use corn fiber and to distinguish the “superiority” of their products (that don’t contain corn fiber but something slightly “fancier” and more expensive). That doesn’t mean corn fiber is “bad for you,” however. In fact, research shows it’s a healthy source of prebiotic fiber, and although people sometimes think the corn fiber in a supplement or food product is upsetting their stomachs, it’s actually something else, like the total amount of fiber from all sources or amount of sugar alcohols. Your bars upset my stomach. What can I do? Keep eating the bars and see what happens. If you’re new to our bars and are experiencing gastrointestinal distress, you might find that after a week or so of eating them regularly, your stomach adjusts and symptoms simply disappear. Eat the bars less frequently. For instance, some people find that one bar every 24 hours or so is perfectly fine, but if they eat two in the same time frame, their stomach will get upset. Eat the bars slower with more liquid. Instead of slamming bars down in a few bites with no liquids, try eating them slower while sipping on a beverage in between bites. Why do you use a protein blend? Why aren’t exact amounts of each type of protein listed on the label? We decided to use a blend of whey and pea protein because they’re more or less equally effective for gaining muscle and together produce an outstanding texture and mouthfeel (better than whey alone and whey plus micellar casein, which we also tried). The exact amounts of whey and pea protein aren’t listed on the label because protein bar manufacturers are funny about sharing that kind of information on packaging! Or about 75% whey and 25% pea. Your bars are kind of expensive. Why should I buy them over cheaper alternatives? You can certainly find cheaper protein bars, but what are you getting for your money? Contain low-quality forms of protein, like milk protein, calcium caseinate, and soy protein. Contain a number of other undesirable ingredients, including corn syrup, maltodextrin, artificial sweeteners, dyes, and flavors, and other chemical junk. Taste mediocre at best, and often much worse. Our protein bars are different. They contain 20 grams of a blend of some of the highest-quality types of protein you can buy: whey isolate, whey hydrolysate, whey concentrate, and pea protein. They also contain 10 grams of prebiotic fiber, which supports your overall health and well-being in a number of ways. That doesn’t mean we skimped on the taste, either. We worked on samples for nearly a year to ensure that every bite of our bars is savory, moist, and pleasantly chewable. Our goal was to create a bar that tastes like high-protein candy, and many of our customers say we’ve done just that! . Why do you use palm oil? Isn’t it bad for the environment? We put a small amount of palm oil in each bar because it’s a natural way to improve mouthfeel and shelf life. And yes, there are valid environmental concerns about how palm oil is cultivated, including greenhouse gas emissions, deforestation, and water pollution. That’s why we use only sustainably sourced palm oil in our protein bars, which comes from manufacturers that meet the standards set by the Roundtable on Sustainable Palm Oil (RSPO). How many “active” or “net” carbs are in each bar? Technically, each bar contains about 28 grams of “active” carbs, but that doesn’t mean you should only “count” that many if you’re tracking your macros (macronutrients). Although the 10 grams of “nonactive” carbs are from fiber and erythritol and contain fewer calories than the “active” carbs, they still contain calories. Therefore, if you want to be as accurate as possible in your calorie and macro tracking, we recommend you simply count all 38 grams of carbs in each bar. Will your bars spike my blood sugar levels? Yes, but not in a “bad” way. Your blood sugar levels will rise after eating one of our bars, but the increase will be relatively small and sustained, meaning there won’t be a crash or other negative aftereffect. Our bars contain whey concentrate, which contains lactose. Our bars don’t contain gluten. Is your bar keto friendly? Our bars weren’t designed to be keto friendly as they’re intended for the everyday person who doesn’t follow any particular style of dieting. Is your bar vegetarian friendly? None of the ingredients are derived from meat. Is your bar vegan friendly? Our bars contain whey protein, which is made from milk.